On an island in the river Spree you'll find five world-renowned museums gathered in an amazing ensemble of beautiful buildings, squares and courtyards. The complex is called 'Museumsinsel' (Museum Island), and very much worth a visit. 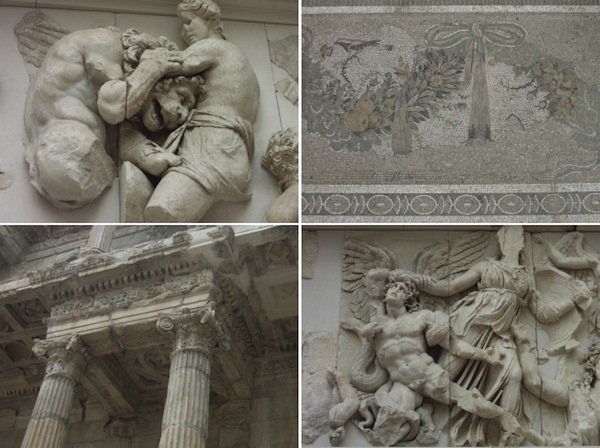 My favorite is the Pergamon Museum, and even if you have only an hour to spare, it will be worth the time. If you have more time, you can wander through the beautiful collections of Islamic Art. The "Clärchen's Ballhaus" is a Berlin instituion, and one of the last remaining dancehalls from the 1920's. It opened in 1913, and has a rich and colorful history. 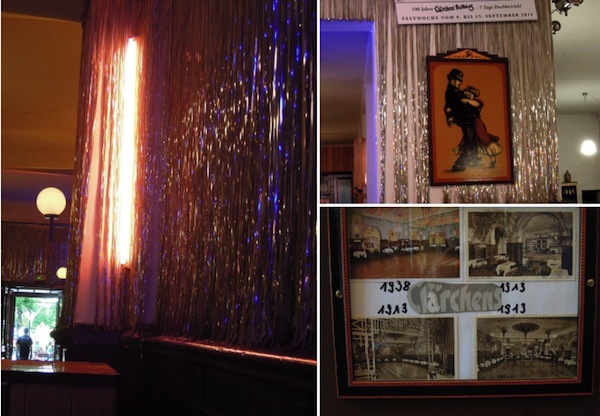 The downstairs ballroom is still reminicent of the shortages in communist post war East Berlin, and in keeping with the style, the tables are decorated with carnations and wine bottles as candlesticks, and the walls are covered in tinsel. To this day, you can come and dance swing, cha-cha, tango or waltz in the evenings, take dance classes, or enjoy the restaurant's excellent traditional german food. 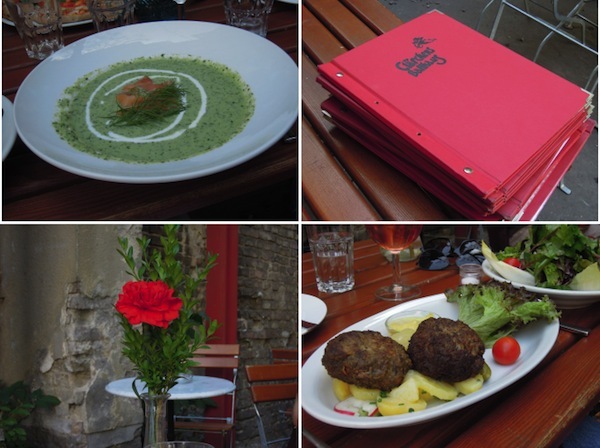 From 'Clärchen's Ballhaus' it is just a short distance to the 'Hackesche Höfe' (Höfe means courtyards), which are located across from the bustling 'Hackeschen Markt' café and restaurant area. The Höfe consist of beautifully restored houses, which are interconnected by tranquil and charming courtyards. The courtyards house an array of small shops and galleries. 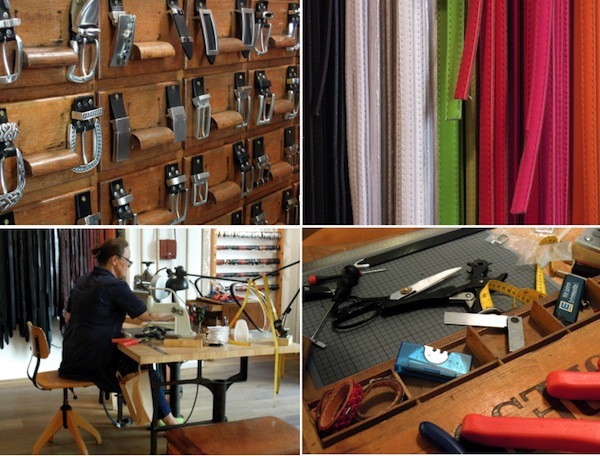 'Hoffnung Berlin' is located in courtyard no 4, and makes made to measure belts. The concept is easy... you chose a buckle, a strap and a tip, and after you have been measured, your belt will be made for you in about 15 minutes. Belts are displayed on vintage leather sports benches and medicine balls, which reminded me of gym classes in primary school. It has featured in many blog posts, and I have often been asked where it comes from. The Friedrichstrasse in Berlin Mitte is a wonderful shopping area, lined with boutiques, bookstores, and restaurants. 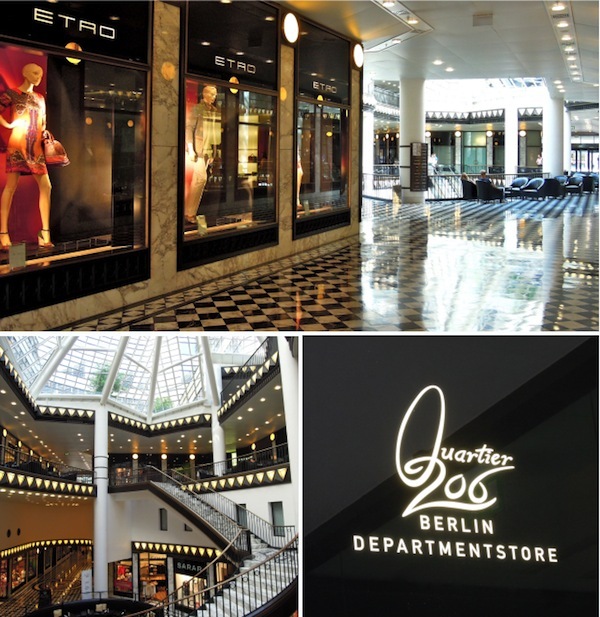 At number 71, you find the Quartier 206 shopping mall. The mall has an array of great shops, and it also houses the 'Department store 206', which reminded me of Paris's 'Bon Marché'. Although much smaller, it offers a wonderful selection and mix of brands. Thank you for giving your blog followers a tour of Berlin. You are a wonderful travel guide, especially for those of use who want to visit but need to be armchair travelers for the time being. Liked your selection of TB tunics, which will look lovely on you. TB NYC and the US department stores carry different colorways and styles. Do you have time to do a late summer/early fall capsule wardrobe update? The shock I got when I stepped into this dark room in the Neues Museum and finally found myself face to face with Néfertiti herself! I could not take my eyes off her forever as I seemed to have this room for myself! The Egyptian departmentin the Museum is fab and especially their Amarna period collection: did you have a chance to check it out? It was just baffling to see all those artefacts that I'd only been able to see from the pages of books since I was a child... Berlin is fab anyway, I should really get back there. As some of the Hisory there is all so recent, it makes it all the more palpable: very strange but compelling atmosphere in that city. Again, Maitai, thank you for sharing! Oh how amazing your encounter with Ms N must have been, dear Béatrice! How very lucky to have had the room for yourself. I ‘met’ her in 1987, but the displays back then were less impressive than today. Wish I’d seen her like you. My list of 'Berlin - things to do' is still so very long, like you, I’d love to go back one day soon. Have a great weekend! Dear MT, I love the belt, but it looks heavy, is it? Also, any sharp edges or corners on the inside that may damage the clothing? There is no flimsiness about the Eisenhans! Mine weighs a little over 500gr ;-) It is perfectly smooth inside and out, and has no sharp edges. Good shopping, good food and fine art -- sounds like heaven to me! Tory Burch does know how to do a tunic. Love your choices. And how did you know I was on the hunt for a new belt. That one with the dragon buckle is very rock 'n roll and a bit dangerous looking. 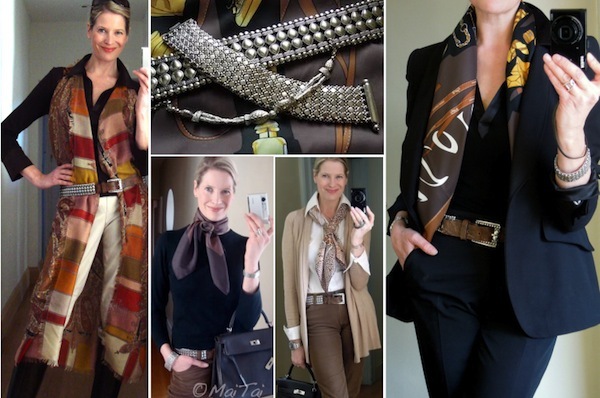 Tempting but it's a pretty big statement and would detract from one of my precious scarves! I did notice your photo of the Etro shop and my little heart did skip a beat! The Darla silk tunic reminds immediately of the butterflies dress you wear with the Belles du Mexiques! What great ideas for places to visit. Of course you can have a good guidebook but nothing beats a personal recommendation. I'm hoping at some point you do a mini travelogue for London, I'm sure that you know some hidden gems that I'm not aware of. Those tunic tops are very pretty, especially with the farandole, I've never bought anything from that shop before but will have to investigate! Very happy you enjoyed the series, my dear tara, and glad you like the tunics! I used to live in London for a while, it was a great time. Some favorite old spots still exist, and some new have come up since. Looking forward to going back one day.. a London travelogue would be such fun to do! I've been reading you for quite sometime via Facebook and email (and have purchased scarf rings from you and will be purchasing more!) but never thought about checking you on bloglovin. I'm glad I did! Your tour of Berlin is amazing, you really convinced me to go. I've been thinking about it so the decision is sealed. Thank you! A very warm welcome to you! Here is very much where the heart and roots of my blog and collection are, glad you have found us here :-) Very happy too that you are enjoying your scarf rings, and hope you’ll have the chance to visit Berlin one day soon. Have a great week ahead! What à fascinating tour! I have been to Germany many times, started when it was still divided, but only visited Cologne, Dusseldorf and Munich a long time ago but always wanted to go to Berlin, which is supposed to be such a cultured and vibrant city. Definitely earmarked this page for future travels. Thank you for this wonderful series Mai Tai. I have been to Berlin twice - once in 1979 and once in 2011. I'm hoping to take my husband there next year so your recommendations will be very useful. How great to have seen Berlin when still divided, it gives such a different perspective to the amazing changes since the unification. Hope you'll make it again next year again.. have a wonderful time! You've convinced me dear MaiTai, Berlin is now on my bucket list! From your posts, Berlin looks rich in culture and history with so much to see and do. Have truly enjoyed this travelogue. 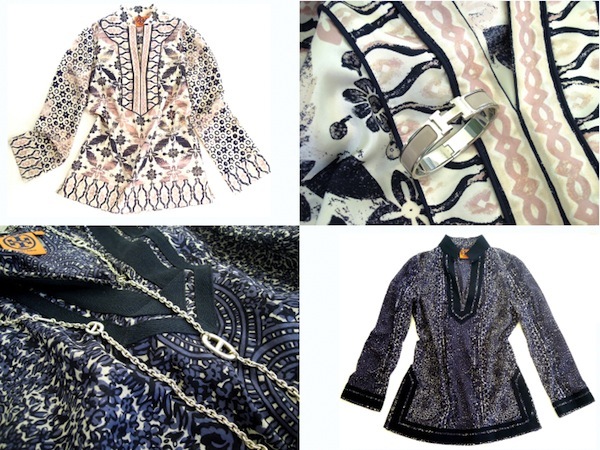 Love your Tory Burch tunics and can't wait to see how you style them. Glad I convinced you, dear Simone, and I hope you’ll have fun on your visit! Berlin has so much to offer, and I still have not explored all I wanted to see. Longing to go back already! Well, I just ordered the belt and also another with a giant dragon buckle, just for fun! Thank you for generously sharing your sources and for taking us on a whirl around Berlin! I am fascinated with the Pergamon Museum. How beautiful it must be! And the old 'Ballhaus'. How interesting! So lucky to find a belt like yours. It must have been a huge surprise to you! Your tunics are both very pretty and I can't wait to see you wearing them. You're such an excellent photographer! 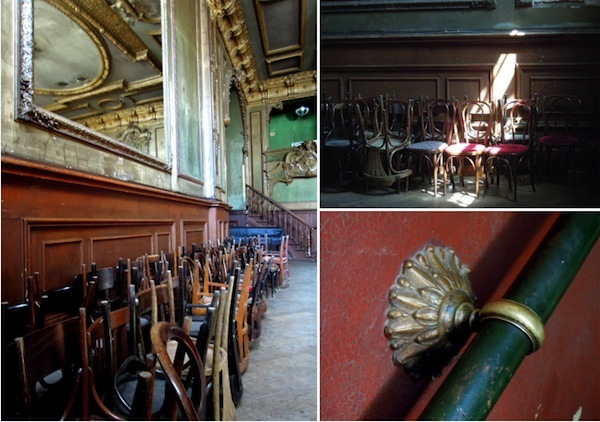 I've enjoyed all of your photos, but the ones of the Clarchen's Ballhaus are stunning. Yes, I second the Pergamon! Another trip down memory lane. :-) Love your new tunics. Seeing the off-white, pale pink, and black makes me wonder which new FW scarf you have your eye on in that color combination. I'm deciding between two of them in that cw. You are amazing! A belt bought 15 years ago still fits! How disciplined of you! Well done! Hi Cordelia, I did not buy mine from Hoffnung Berlin, but fould it in a London boutique a long time ago.. there was no specification regarding the leather/color, but it seems very similar to the one displayed on the medicine ball. Good luck!